Doha Bank continued its efforts to spread the message of environmental protection and sustainable development by joining hands with Qatar’s Ministry of Municipality and Environment (MME), Al Wakra Municipality to host a ‘Beach Clean-Up’ event at Al Wakra Family Beach, with the theme ‘Save The Beaches For the Future’ to show its commitment to the environment and to support the (forthcoming World Environment Day global event – 05th June) on 12th May 2018. 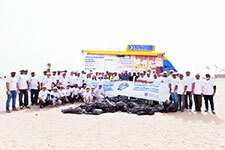 The initiative aimed to creating greater community awareness about the need to protect and preserve the natural environment and keep the marine habitat safe and trash-free, the Beach Clean-up event was led by Doha Bank’s Management and volunteer staff members who actively picked up litter and trash collected along the shoreline. Commenting on the announcement, Dr. R. Seetharaman, CEO of Doha Bank, said: “While Doha Bank has always championed giving back to the community, the Green Banking initiative has truly seen us outdo our own expectations and bring about significant positive change for sustainable environmental management. Doha Bank is fully committed to support a proactive role in creating greater public awareness that build on our existing efforts to give back to the society. Meanwhile, such eco-friendly initiative will benefit everyone, from local residents to international visitors who can enjoy the beauty of our country at its pristine best. We would like to thank the Ministry of Municipality and Environment and Al Wakra Municipality for their support and contribution to the successful Beach Clean-up event and we look forward to more joint sustainability initiatives. Doha Bank organizes a number of environmental initiatives each year as a part of its Corporate and Social Responsibilities (CSR) activities, including the ECO-Schools Programme designed to encourage schools in Qatar to proactively participate in the implementation of good environmental practices. Foremost upon the list is the Al Dana Green Run, one of Qatar’s largest community events; the 13th edition of the annual run took place in December 2017 at Aspire Zone in Doha, drawing participation from thousands of residents. The Beach Clean-up campaign is part of Doha Bank’s ‘Green Banking’ initiative that increase awareness on pressing environmental issues. Doha Bank has also held Tree Planting activity to save the environment by planting more trees and promote healthy living and sustainable development. Furthermore, Doha Bank’s ECO-Schools Programme is open to all Schools in Qatar, with FREE registration and it encourage students to become environmental advocates at a young age.